Measuring up to 4 feet long, green sea turtles (Chelonia mydas) are the world's second largest sea turtles. They live in tropical and subtropical marine waters all across the globe. When the time comes for females of the species to lay their eggs, they always do so on the same beach and can travel up to 1,500 miles to get there. 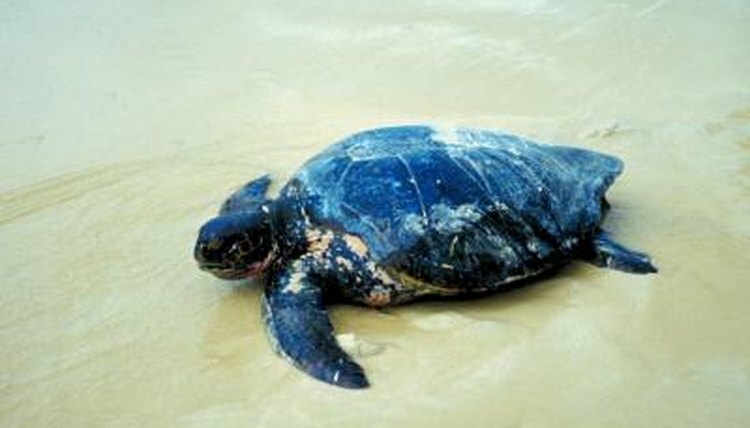 Breeding season for green sea turtles occurs during late spring and early summer each year. Males gather near known nesting beaches and wait for females to arrive. While females will breed only once every three to four years, males are ready to mate during every breeding season. This means more males are looking for mates than there are females, and competition between males may result. This competition can be quite violent and females may end up mating with more than one male, which allows for better diversity of genetic material. When female green sea turtles are ready to lay their eggs -- usually a few days to a few weeks after copulation -- they make their way out of the water and onto their natal beach, usually near nighttime. They make their nests above the high tide line by digging holes in the sand. These holes are known as "body pits" and are slightly bigger and deeper than their bodies. Inside the body pits they make a further depression called an "egg cavity," into which they lay their clutch of eggs before covering them with sand. After an incubation period of 50 to 70 days, the young green sea turtles hatch out of their eggs and make their way from their nest into the sea. This is a treacherous time for the hatchlings, as a range of predators are waiting to pick them off before they can disappear into the water. Once young males have reached the ocean, they will never return to dry land again, but -- once they've reached sexual maturity -- females will return to the very same beach they're leaving to lay their eggs.